After one year later, it’s the moment Microsoft Surface fans have been waiting for: the new Surface Pro 4 tablet has eventually been released in New York on October 6th. As the thinnest Core PC and Surface tablet, this Surface Pro 4 is only 8.4mm thick. Meanwhile, it's a pity that the Surface Pro 4 still not equipped with CD-ROM so that we can’t play DVD on Surface Pro 4 tablet directly. To realize watching DVD movies on Surface Pro 4 freely, you need to rip DVD to Surface Pro 4 first. Getting one up on the Surface Pro 3's 2160 x 1440 pixel-resolution display, the Surface Pro 4's screen jumps from 12 inches to 12.3 inches diagonally in size and the screen resolution has increases to 2736x1824 at 247 PPI which is the biggest merit for ripping DVD to Surface Pro 4 and then playback on it. Its aspect ratio still remains 3:2. So comparing with the predecessor, Surface Pro 4 tablet makes noteworthy improvements in all directions. This is undoubtedly a good condition for us to play DVD movies on Surface Pro 4 – the thinner, lighter and more outstanding tablet. WinX DVD Ripper Platinum - NO. 1 DVD ripper which can help you rip any movie DVDs, including copy protected ones to Microsoft Surface Pro 4/3/2/RT, iPhone 6s/6s Plus, iPad Air 2 etc., and delivering 3-5x faster speed than common DVD rippers in market. Maybe for most people, they are not willing to spend a penny on a DVD ripper. Therefore, here comes WinX DVD ripper, a remarkable Surface Pro 4 DVD ripping freeware, which helps you free rip DVD to Surface Pro 4 quickly and easily. However, the most obvious drawback of free DVD ripper is the limits in its function. Say, it can't analyze region code and rip protected DVD like Disney DVD movies and newest DVD video movies. Fear not, you are highly recommended to upgrade to WinX DVD ripper platinum – the all-in-one and powerful Surface Pro 4 DVD ripper & converter. Although this ripper for Surface Pro 4 is not freeware, you can also free download it for the trial and then you can decide whether it’s able to cater to your demands. 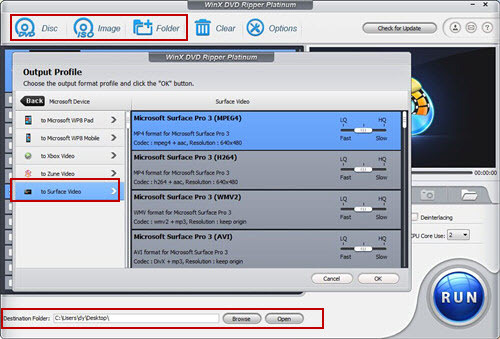 As the award-wining Surface Pro 4 DVD ripper software, WinX DVD Ripper Platinum can easily unlock all copy & region protections like DVD CSS, region code, Sony ArccOS, Disney X-project DRM and even rip the latest strongly encrypted or newest DVD discs/ISO images to Surface Pro 4. For instance, you are able to rip Furious 7 DVD and Avengers: Age of Ultron as easy as blowing off dust. This DVD ripper for Surface Pro 4 offering the NO.1 fast ripping speed and without any loss of quality due to the support of up-to-date high-tech Multi-core (up to 8) CPU and Hyper-threading and high quality engine. Plus, WinX DVD Ripper Platinum is not only an omnipotent ripper to easily rip DVD to Surface Pro 4, DVD to Surface Pro 3/2/RT, it also capable of ripping DVD to iPhone 6s/6s Plus, iPad Air 2/Pro/mini, DVD to MP4, AVI, H.264, MPEG, WMV, MOV, FLV, etc. How to Rip DVD to Surface Pro 4 Easily? Easily rip movie DVDs to Surface Pro, iPhone, iPad etc. on Win 10/8/7 and Mac OS X. How to Rip DVD to Surface Pro 4 with the Best Surface Pro DVD Ripper? For your convenience, this DVD ripper has both Windows version and Mac version. And here we will take Windows Surface Pro 4 DVD ripper version and screenshot for example as the guide of ripping DVD to Surface Pro 4. So before going further, please free download this DVD ripper for Surface Pro 4 tablet. Step 1: Load your DVD movie. 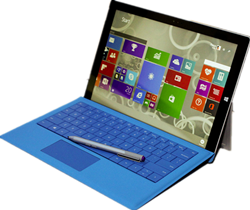 After successfully installing and launching this best Surface Pro ripper, you are able to insert a DVD disc or load ISO image file or open DVD folder by clicking the corresponding button in the upper user interface. Few seconds later, this smart Surface Pro 4 DVD ripper will automatically identify and select the main title then pop up a window which facilitates you to choose the output profile as you need. Let’s choose Microsoft Device > to Surface Video > Microsoft Surface Pro 3 (MPEG4) then click “OK”. You can also adjust the slider from LQ (faster converts, lower quality) to HQ (slower converts, higher quality). Note: In output profile, there is no clear difference between Surface Pro 3 and 4 so Surface Pro 4 users are still able to use Pro 3 profile. Better still, Surface Pro 4 profile is coming soon. Step 3: Select destination and begin to rip DVD to Surface Pro 4. Click browse button to set destination folder then tap “RUN” button to start the course of ripping DVD to Surface Pro 4 tablet. After finishing the conversion, you can sync DVD movies to Surface Pro 4 for playing freely. WinX DVD Ripper Platinum is the No.1 fast DVD to Surface Pro 4 ripping tool. With the most advanced decryption technology, you are free to rip any blockbuster DVD movie to Surface Pro 4/3/2/RT faultlessly. 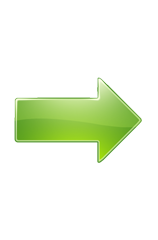 In the same way, you can also fast copy DVD and convert DVD to AVI, WMV, MOV, M2TS, FLV and other PC/Mac general videos.